The cake Choi Jin Hyuk received from fans I guess.. Look at the details..they even give the tiny CJH a bandage on his eyebrow.. But I must say it looks nothing like CJH. Princess So Jin is soo extra..I love it. How she exaggerate her lines..! Has anyone counted how many times someone has drawn a gun, sword, flower vase, brick or a pot on Chun Woo Bin/Na Wang Shik in this drama? Maybe I'm wrong but I think the writer think about wb-sn romance very deep and carefully. They never ever cross the line. There are so many chances if the writer wants. I think it is a safe choice. If it is decided the endgame is Sunny-WB, the romance should looks sweet, soft but clean (means Sunny isn't married woman anymore). But if the endgame isn't with woobin, sunny still also 'clean' from any unappropriate moves with WB. It's not wrong to like any charactes in this drama coz everyone has their own preference. But still it is wrong to hope the innocent girl end up with bipolar and criminal like Hyuk. Why? Simply because the girl doesn't like him anymore and the guy doesn't change. We see how many times Hyuk try to hug her and she uncomfortably rejected yet this fool emperor doesn't understand. He just too selfish. we don't need to see grand words or actions as we already know how wang shik feels about sunny and the trust between them... a quiet scene I liked was when sunny is walking and there is a wood curtain type separating them and wang shik is walking on the other side and they do a subtle nod to each other indicating the plan is on. it indicates team work, co-ordination as well as trust. perhaps, the difference is that those villains knew they were doing wrong, felt some measure of guilt but kept convincing themselves that it was necessary. so the weight of their actions hung over their heads and there was a sense of coming doom... hyuk, ED, nanny -- pretty much all the villains here suffer from entitlement complex where they feel that they are entitled to do what they feel like and there will be no repercussions for their actions. there is zero guilt..
the only one who felt some amount of guilt was yura but then she shakes it aside... so yura's journey is far more interesting to me as we see her now reeling under this news that kang joo seung was supposedly having an affair with the soo hyun empress. so what will she do going forward? Haha now I know why I couldn’t respond warmly to LH. Yeah there is something cold about him. Also whenever LH displayed his emotion, it seemed a bit theatrical even when he was in distress. I didn’t think much about YR because she seemed to be a straightforward villain but her story line suddenly became a bit complicated and tragic with the revelation of her affair with KJS who was SH’s guard and trapped in a psychiatric ward. This explained why she closed out her feeling for DS after KJS disappeared. At this late in a drama, I have a feeling soon YR will learn about ED’s dirty trick and then be ready to help WB when his identity might be discovered by ED. Yeah I’m curious how the writer would handle her story line?? @Lawyerh I love your screenshot so much. It captures the dorky love in Hyuk's eyes. Lolol. * to SN : "i will never let u leave the palace, you'll be my empress till the day you die"
* "I'll not reveal the truth bcos you'll leave me"
* to SN "please leave the palace and go live happily for the rest of your life, I'll settle the revenge"
why why why? why do k-netizens still want SN to be with LH???????? i cannot understand. Because WB is a safe and ordinary choice, while LH x Sunny is a more complicated and dramatic relationship. It seems like people never get tired of beauty and the beast trope and all kind of "beast". especially rich and royalty "beast"
I loved how he whipped out double guns when he has workers that can do the dirty work for him. Hyuk is cray and i usually dont like cray2 characters but TLE is one of those exceptions. So many crays and its highly entertaining. It's okay to play beauty and the beast as long as both party involved must have the same feeling. If it is one side only, it will only hurting one another. From what we see, Sunny doesn't love Lee Hyuk anymore. She's using him. Means, he will get hurt knowing the upcoming truth. On the other hand, Lee Hyuk is being obsessive to her. And it is danger for Sunny knowing him emotionally unstabile. The writer may change the plot later, but Sunny is definitely developing feelings to Woobin without her realizing. She was curious and worry why he didn't even called while looking at the stars Woobin made. I'm not against Lee Hyuk-Sunny paired IF he plays clean. The Last Empress is a South Korean drama set in present day South Korea, where the country is governed by a constitutional monarchy. It stars Jang Na Ra, Choi Jin Hyuk, Shin Sung Rok, and Lee Elijah. Oh Sunny (played by Jang Na-Ra) is a musical actress with a bright personality who suddenly marries Emperor Lee Hyuk (played by Shin Sung-Rok). There, Oh Sunny goes up against the imperial family and fights against their misuse of power. Meanwhile, she falls in love with Na Wang-Sik/Chun Woo Bin (played by Choi Jin-Hyuk) who is a bodyguard of the imperial family. Na Wang-Sik returned to the palace as Chun Woo Bin to avenge his mother’s death. You can find English subbed episodes at .....or www.viki.com. The Last Empress is the most well-received and highest rated Korean drama of the last quarter of 2018, besides Sky Castle. A few weeks ago, there had been a rumor that the lead character of the drama was changed to Lee Hyuk, as opposed to Na Wang Sik, who from the original synopsis was the lead character. The rumor was fueled by the continued comic and pitiful portrayal of Lee Hyuk, who is the villain in the drama. I had expected that by the second half of the drama, his crimes would be unraveled, and he would be made to answer to his crimes. However, viewers are presented with a playful and funny side of Lee Hyuk, which is a surprising and a bit refreshing to watch. The writer did a successful job of making Lee Hyuk lovable, despite his numerous crimes. Based on the responses of viewers, about 80% are hoping to see Lee Hyuk redeemed, and have a happy ending with Oh Sunny. The major reason why Lee Hyuk’s character has appealed to viewers is because the writer excellently showcased the many facets of Lee Hyuk; his villainous, then pitiful, and funny sides. Of recent, he is being portrayed as a struggling and remorseful character, and this has left many viewers extremely confused. For instance, I noticed that the angry emotions I had felt against Lee Hyuk in the first half of the drama had almost been forgotten, and I instead found myself feeling sorry for him. I also don’t quite know how to react to his funny scenes. I, like most viewers, are left unsure whether the writer is aiming for a bad-guy-turn-good trope for Lee Hyuk. The efforts he has been making to make amends to Oh Sunny for his crimes against her and her family, and his show of affection for her has not gone unnoticed. I feel his affection and supposed ‘love’ for her is born out of his possessive tendencies, rather than true love. This explains why most of the viewers are hoping for a happy ending for he and Oh Sunny. It is common for everyone to want the villain punished and pay for his crimes. However, much of the sympathy Lee Hyuk is getting from the viewers is due to the portrayal of his troubled childhood. I found that unnecessary to his role as a villain, and inexcusable for his crimes. I recently read a comment mentioning that his flawed character was so realistic and relatable. This might be true, but committing various hideous crimes ranging from running Na Wang Sik’s mother over with his car and burying her body to attempting to kill Oh Sunny are not an average person’s flaw. Despite acknowledging some of his crimes to Oh Sunny, and showing despair about the death of the late empress, he is simply unredeemable. Furthermore, he does not seem genuinely apologetic for his crimes, and is likewise yet to show any remorse. An example of this is when he remarked that he does not understand why Na Wang Sik was trying to attack him (Na Wang Sik had aimed a knife with a note attached at the wall where Lee Hyuk was seated) as his mother’s death was not a big deal. If anything, he is only trying to redeem himself to earn Oh Sunny’s love. It is still unclear how this epic and crazy drama will end, but I hope the writer secures a happy ending for Na Wang Sik and Oh Sunny, and ensures that Lee Hyuk gets severely punished for his crimes. @hahanzyy, thanks for pointing out some important facts that some people might be overlooking. Some Lee Hyuk supporter seems to be upset that Sunny and Woo Bin are betraying Lee Hyuk when he trusts them so much. The reason why Sunny is against Lee Hyuk is because how cruelly, horribly and disgustingly Lee Hyuk betrayed her trust..She was just a fangirl of the Emperor of her country..She could just go on like a Happy Bubbly girl crushing on the charismatic Emperor....But look what happened to her.. While she wanted a happy family with full of love, she found her in a place with full of back stabbing people. She was ready to give all of her love to the emperor but he not only cheated on her but also framed her and tried killing her..after that she was also ready to leave the palace but look how they become the reason why innocent people had to loose their life..Grandma was killed in her own room and Team Manager Hong committed suicide to save Sunny from being framed for the murder case of Grand ED. & do we really have to explain why Chun Woo Bin is betraying the Emperor!! The very reason why Na Wang Shik became CWB is to earn Lee Huyk's trust and take revenge on him when the right time comes. I don't really think we need an explanation why he's doing that. People say he is changed man..But look how he interprets the consequences of his action. 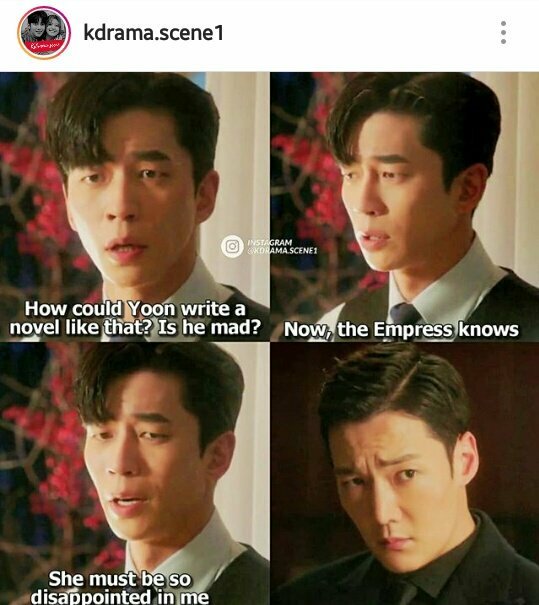 He knows he's the one responsible for the death of Empress So Hyun, he acknowledges it but thinks it's wrong for Yoon to write the story because Sunny will know his bad deeds!! What kind of sane reasoning is that?? He still doesn't know Seo kang Hee's involvement..When he'll get to know that he might even think he's innocent!! When Lh went to visit Sunny´s home I thought that he was going to apologize for all the things he made Sunny go through. If he did that I would have started to believe that he has changed and that he trully feel remorse for his action. I also hate how he was invading her privacy by reading her diary. Hi chingus! I only have time to catch up today. Absolutely enjoyed watching SEK in her role as the ED. Her facial expressions are always so on point. She is now my favorite to watch instead of LH. I won't worry about WB dying, because it is said 3 months, and we know our drama is finishing in less than a month, so going by the way drama like to go with current calender, 3 months is a long time. Eg.the news report of corpse finding on Jan 17th would have coincided with current calendar if not for the cancellation of air time. Lol...Some people said bad things about Woobin and Sunny because betraying him? Oh my...like he never ever cheated or betray someone before. He cheated with Kang Hee and Yura when he was being a married man. He even tried to kill his grandmom. He looked so desperate about Soe Hyun's story. But the next day, he was so cheerful to attract Sunny's attention. This childhood story like an excuse for him to kill or making people's life miserable? Are we sure? Stop acting like he's the most pitiful and regretful. Because he's totally NOT. The king should be independent and strong mentally. Nothing new about that. No king is cry cry baby because he'll take much responsibilities. Ask prince William if you don't believe me I really don't like Lee Hyuk's character. Sorry to say this. He never ever apologize sincerily about his mistakes. He just focus on Sunny because he thought she isn't an easy lady anymore. When Yura was coming back, he just treat her like trash. Did not remember all the hot kisses???? Kkkkk...... I hope he never ever touch Sunny anymore. So creepy. After she finish all of her purpose, absolutely she will going out from the palace. I think Detective Conan, Sherlock Holmes that can solve problems in this palace. Because no outstanding detective appears here with cool analysis. All criminality is perfect evidence (almost) is omitted, manipulated, and can be said to be a crime without proof. Only the confession of the suspect or perpetrator who brings the truth, but the perpetrator is very clever and won't even open their mouth at all. How can Oh Ssu Ni show her feeling as a lover to Woo Bin when she's a married woman? Before Sunny a woman, she is realize that she's an Empress, that's why she wanna solve the mistery in the palace and give right justice. Why Sunny have no assistance? This make Woo Bin always in her side to help. And after Yu Ra kicked out, why LH have no assistance? He make Woo Bin attach to him all the time. We never in the Empress or Emperor position, so we don't know what really happen in the palace circumtance. No matter how hard is that, they have to responsible to the country or the people for stability of nation. Nation stability is more important than Lovey Dovey of two people, except there was a new era. Sunny is the Empress, although she married to Lee Hyuk is bad or her wrong decision, she decide that she wanna marry Lee Hyuk. Sunny and Woo Bin although they wanna make Lee Hyuk down, why I think that they actually help Lee Hyuk to find out the truth that he always afraid about. Lee Hyuk not 100% false in the SH and NWS mother case. Lee Hyuk absolutely have mental disorder, thats why he have paranoid and he felt headache everytime. ED also stupidly keep Kang Hee without know that she's SH murderer, she must catch her to clean LH name not keep her, ED wanna control Lee Hyuk and believe that LH must be a killer. ARi, hope you are clever enough or trained by Sunny to face Kang Hee, just like how DS trained by Byun to face MYR. - How to save Woo Bin from Lee Hyuk?? Yura might join WB-SN if it is clear the palace did something to her fiancee. But too bad if she tell ED/LH who actually Woobin is. To me, Kang Hee is more dangerous person than ED. Sometimes she looks like she gonna help but sometimes not. Two faces. Yura may realize her mistakes and live happily with her fiancee and Dongsik I guess. As long as she give help to WB-SN. No imformation regarding the island until now. And the cookies. And the garden. The writer seems having many homework. How many episodes left? Is it confirm for the extension?